What a delightful little town this is, tucked in at the head of beautiful Oyster Bay off Long Island Sound. Cold Spring Harbor is a hamlet in the Town of Huntington and a charming former whaling port nestled on the North Shore of Long Island Sound along scenic Route 25A. This small, quaint village is home today to an abundance of shops and two museums, so you won’t get bored on a weekend jaunt for a visit. The Whaling Museum, one of the highlights of a visit. Once famed for its big ships and whaling industry, in the mid-1800s Cold Spring Harbor supported a fleet of nine whaling vessels and coastal vessels carrying cargo from Long Island to towns along the Atlantic Coast and Caribbean. It became a United States Port of Entry in 1799 and one of Long Island's busiest whaling ports, as well as one of the most popular vacation destination spots in New York State. In summertime, the town's various cultural events, picturesque harborside park and friendly atmosphere beckon families and visitors in search of something a little more casual than the Hamptons or South Shore scenes. Billy Joel's first album was entitled Cold Spring Harbor and featured a photo of Billy on the cover, with Cold Spring Harbor's Eagle Dock beach in the background. Billy grew up in nearby Levittown. Yep, the piano man is somewhat of a local celebrity, as is Dr. Watson I presume (of Watson and Crick fame who ‘discovered’ DNA, won the Nobel Prize, and is now chancellor of the Cold Spring Harbor Laboratory). Other celebrity residents have included John Lennon from the mid-1970s until his death in 1980, Lindsay Lohan who spent a portion of her childhood and adolescence here, Meg Whitman, CEO of eBay, grew up here, and Wally Szczerbiak, NBA basketball player for the Boston Celtics, attended Cold Spring Harbor High School. Otto Kahn, investment banker built his estate, Oheka Castle, on West Gate Drive, and Louis Comfort Tiffany, stained glass artist, built his estate, Laurelton Hall, in Cold Spring Harbor. The novel Cold Spring Harbor (1986), by the late author Richard Yates, is a quiet suburban tragedy set in the 1940s in this town and avoids depicting the glamorous side in this post-war era. The inner harbor is crowded with small boats. H&M Powles Marina docks are to the left. Cold Spring Harbor is located at 40°51′48″N, 73°26′35″W. Entering Oyster Bay, you'll round either G15 Gong at Lloyd Point or G17 Bell off Rocky Point marking Centre Island Reef. It's a good idea not to cut inside the latter mark, which was moved a but further out a few years back so on older charts it will appear to be out of position. Heading straight into Oyster Bay from Long Island Sound, we usually play it safe and round the light tower at Fort Hill. Besides the fun we have when the osprey is in residence (she is either screaming at you to stay away or feeding her voraciously hungry babes), it’s the safe route around the shallows mid-bay. Just beyond the light tower is Lloyd Beach, from where you can cross the causeway on foot and peer into the far reaches of Lloyd Harbor where power vessel are not permitted. The sailing on the calmer waters inside the Bay is quite lovely, and often you’ll pass fleets of classic boats working their way gingerly around a race course in light air. As you get further in, you’ll approach the outer harbor mooring field of Cold Spring Harbor, separated from the inner harbor by a sandspit that is partially submerged at high water. The water depth is pretty good almost right up to the channel so it is possible to anchor near the entrance to the inner harbor and have an easy dinghy ride in. Billy Joel Park provides a shady retreat along the banks of the Harbor. You can also come into the inner harbor which has plenty of depth but is very crowded with moorings. The place to tie up your dinghy is at the fuel dock of the H&M Powles Marina, although the signs do protest that it's a drop off zone only. For $5, you can stay as long as you like. There is fuel available, as well as bait and tackle. When you go ashore, turn left and walk about ¼ mi into town past Billy Joel Park. Right at the head of the park is a small black hose from which water is running non stop. That’s the cold spring and you’ll see people pull up in their cars, jump out jug in hand, and fill up. If only we’d remembered the jug! Next time. It’s good and it’s cold. Main Street is the heart of the town, and the only shopping strip around. There is no tourist office in the village, but the Long Island Preservation Society's Museum Gallery offers plenty of information on local lore, including itinerary and points of interest along Long Island's Heritage Trail. The main section of town is just a couple of blocks long but chock full of little treasure shops. There’s a Vineyard Vines, antique shops, a candle store, Irish imports, a great art glass and gift shop, a the fabulous Kiva Native American handcrafts shop (ask the very knowledgeable proprietor to tell you the story about the bridge tender and his boat), a general store, a shop that sells custom doll houses, and plenty of other little nooks to stop into. A display in on one of the many shops and boutiques along Main Street. Restaurants aren’t as plentiful and the only choices are seafood and steak at 105 Harbor (across from the fuel dock station), seafood and wines at Bedlam Street, upscale fare at Grasso's and the Gourmet Goddess deli. Great sandwiches there and lots of specialty stuff to bring home with you, especially the chocolates! For fine Italian up-scale dining, try Trattoria Grasso and ask for their pan-seared tuna or monkfish if you'd prefer to skip the pasta for some local delicacies. They also have live jazz every Wednesday through Saturday night. collection, as well as films and special family programs. It’s a couple of blocks past where the shops end in town. Just keep walking down into the residential area and you’ll find it. On a previous visit, we really enjoyed learning about the roots of whaling in the region and the museum shop was a nice place to part with a few coins and pick up some unique gifts. Gourmet Goddess deli and emporium. The other museum is a historical society museum and they do thematic exhibits. This summer they had a great exhibit on the bridges and resorts that were planned for Long Island but never happened or disappeared shortly after conception. We had no idea that we came that close to a bridge between Long Island and Rye to shorten the ride to Connecticut ! Another year, they had an exhibit about the great old estates, with special emphasis on Louis Comfort Tiffany’s place and works. It’s always worth a visit. Also, the DNA Learning Center, the educational arm of Cold Spring Harbor Laboratory and the world's first biotechnology museum, is a wonderful place to bring the kids. The Cold Spring Harbor Fish Hatchery and Aquarium offers educational programs about the natural aquatic systems of New York State . The DNA Learning Center provides insights into the origins of life. 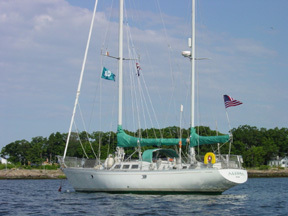 On the way out of the harbor, head to port along the shore of Cove Neck. You'll notice a rather colorful display of flotsam and jetsam, fairly reminiscent of a "Robinson Cruisoe'esque" display. The day we came by for a closer look, an aging gentleman was tending to his collection, no doubt arranging a new find in just the right spot. The signs posted made clear that he does not invite visitors and we respected his privavcy from afar with wide eyed interest. A colorful but very private display by a collector just outside Cold Spring Harbor. If you look closely, you can just make out the human figure tending to the collection at the center of the image.